After spending over a decade trying to establish milkweed plants on our property (what monarch caterpillars eat), healthy plants finally emerged a couple of years ago – in the flower beds next to our house, not close to where we were trying to grow them. While most "weeds" are not welcome in the flower beds, we embraced what we got and allowed them to prosper in place. This year, milkweed plants started growing randomly throughout the yard, though frequent lawn mowing kept their visibility near nothing. After an especially long period of rain, the yard crop started showing leaves and my observant daughter spotted a monarch laying eggs on them. Prior to the next lawn cutting, she and my wife removed over 40 eggs from the rogue plants. Most of the eggs were transferred to the being-tolerated flower bed plants and several were raised indoors, which produces perfect specimens for photographic purposes. The ideal time to photograph butterflies is just after they emerge as their wings are in perfect condition and they remain mostly still for a couple of hours. 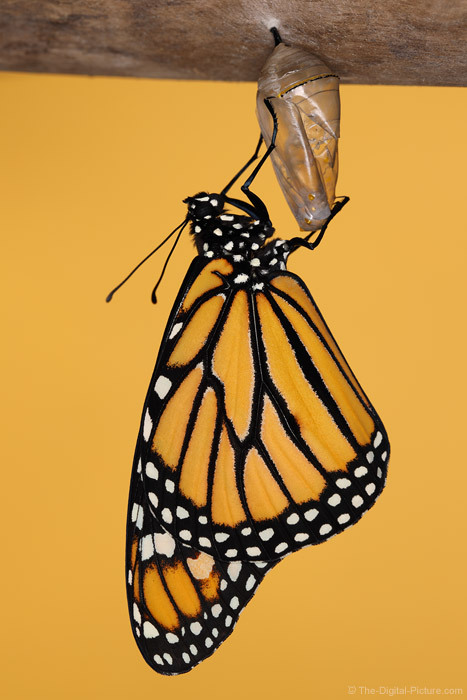 Knowing when that time is coming involves observing the monarch chrysalis color. Newly-formed chrysalises are bright green in color, but they turn very dark just prior to emergence of the butterfly stage. I saw this opportunity coming and had some gear ready. When your camera is an EOS model with a hot shoe, the set of lighting accessories available, both Canon brand and third party options, is vast. For this image, I used a Canon Macro Ring Lite MR-14EX II Flash for a very even light on the subject. With the dual MR-14EX flash tubes configured for equal power, this flash creates a flat light, often void of shadows. When the subject is as vibrantly-colored as this one, flat lighting works quite well. The background is a piece of orange paper (I tried a variety of colors) being held with a Delta 1 Grip-It Single Arm with 1" Clamp (extremely useful accessory) and lit with a remotely-controlled Canon Speedlite 600EX-RT Flash. Alternatively, I could have used a white paper and gelled the flash to create the desired color. The background light being positioned behind the foreground light meant that it did not influence the lighting on the subject and the background being far enough behind the foreground meant that the foreground light did not influence the background brightness. While I didn't expect the Canon EOS R to have any trouble with Canon's Speedlite system (other EOS models don't), it is always nice to have reassurance, especially for a new camera line. Or, maybe this test was just the excuse I needed to spend a couple of hours photographing the monarch. At macro focus distances, depth of field becomes very shallow. One of the keys to capturing this image was to align the camera so that the wing was perfectly parallel to the imaging sensor, perpendicular to the center of the lens' image circle. Still, f/16 was needed to obtain the depth of field necessary to keep almost the entire butterfly sharp.